Join this 2-hour experience in Tokyo and learn kyudo, the Japanese art of archery, from an experienced instructor who will guide you through every step to help you hit the target. 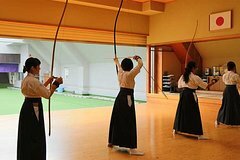 Usually when people take up kyudo in earnest, it takes several days of practice before they are allowed to actually shoot at a target, but this class lets you go straight into action. Don a traditional kyudo uniform, channel your inner samurai, and aim at the middle of the target! *You will be informed of the location after your booking is confirmed.